Following the release of Wanted Johnny Texas in 1967, Emimmo Salvi seemed to simply vanish off the face of the earth. What happened to him is a mystery, and the reasons for his disappearence from the Italian film industry are unknown. Considering he’d been so busy over the past decade in such a variety of roles – writer, producer, director – the abruptness with which he stopped being involved with cinema is strange. By 1965, the peplum as a whole had already become over-familiar with audiences, not to mention seeming increasingly outdated in the modish new world, and as a result ticket sales were declining and profit margins dropping. 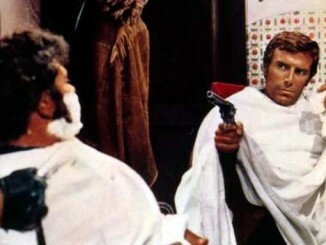 Emimmo Salvi, like many of the filmmakers and producers who had previously worked in the genre, decided to switch his attention to a new format that was just approaching its peak of popularity: the spaghetti western. Having worked his wayward magic with both Roman and Arabian mythology in Vulcan Son of Jupiter, The Seven Tasks of Ali Baba and Sinbad and the Seven Saracens, director Emimmo Salvi obviously felt the need to explore new ground with his next peplum, Treasure of the Petrified Forest. So he turned to the ancient Eddas, the tales of Norse Gods and heroes that had been handed down from Viking times, and had also proved inspiration for both The Lord of the Rings and Wagner’s Ring Cycle. After his sole excursion into the espionage genre with FBI chiama Istanbul, a production that proved influential at the time but now appears to be lost, Emimmo Salvi returned to the peplum with Ali Baba and the Seven Saracens. For his first film, Vulcan Son of Jupiter, Emimmo Salvi was working from a script by himself and his usual writers Ambrogio Molteni and Benito Ilforte, and he started as he meant to go on: this is most unmistakeably a Salvi film, there’s simply nobody else who could have come up with anything quite like it.